In the current economic climate, spending more than you have to for workers’ compensation insurance doesn’t make sense. Workers’ compensation premiums are on the rise again, right at a time when reducing practice expenses must be a priority for every physician. The Association sponsored Workers’ Compensation program, with its 5% member discount (15% depending upon where you place your group health insurance) will be even more important to members this year. When you place your coverage with Employers Compensation Insurance Company, the sponsored program insurer, chances are your savings will exceed the 5% program discount. Rather than guess what your savings can be, take a moment to contact Marsh and let us show you how your membership in the Association can deliver a quality insurance program and exceptional savings to you. Please call a client service representative at 800-842-3761 today. The process is simple and fast. Just ask for a premium indication form, complete and fax back to Marsh. Let us show you how your Membership in the Santa Clara County Medical Association can save you money. Seabury is a subsidiary of Marsh Risk and Insurance Services, CA License No. 0633005 ©2009 Seabury & Smith Insurance Program Management • 43351 (3/09) 777 South Figueroa Street, Los Angeles, CA 90017 • (800) 775-2020 • CMACounty.Insurance@marsh.com • www.MarshAffinity.com Marsh is part of the family of MMC companies, including Kroll, Guy Carpenter, Mercer and the Oliver Wyman Group (including Lippincott and NERA Economic Consulting). Address all editorial communication, reprint requests, and advertising to: Pam Jensen, Managing Editor 700 Empey Way San Jose, CA 95128 408/998-8850, ext. 3012 Fax: 408/289-1064 pjensen@sccma.org © Copyright 2009 by the Santa Clara County Medical Association. Opinions expressed by authors are their own, and not necessarily those of The Bulletin or the Santa Clara County Medical Association. Acceptance of advertising in The Bulletin in no way constitutes approval or endorsement by the Santa Clara County Medical Association of products or services advertised. Organized medicine, particularly the SCCMA and CMA, is now more important than ever before, at least as far back as I can ever remember. 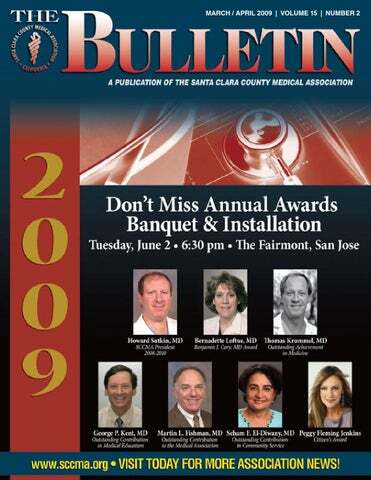 Howard Sutkin, MD is the 20082010 President of the Santa Clara County Medical Association. He is board certified in plastic and reconstructive surgery and is currently practicing in the Los Gatos/San Jose area. or regulatory changes which will help you to serve your patients more effectively. Some change is good, some is clearly bad. We can no longer afford to sit back and let stuff just happen to us anymore. Let’s take charge! By Joseph Andresen, MD It was 1993: Louise: But this was covered under our old health insurance plan. Harry: Yea, that was a good one, wasn’t it? Moderator: Things are changing and not all for the better. The government may force us to pick from a few health insurance plans designed by Washington bureaucrats. Louise: Having choices we don’t like isn’t having any choices at all. Harry: And they choose. Louise: And we lose. Moderator: For reforms that protect what we have, call toll free 1-800/285-HEALTH. Know the facts. If we let the government choose, we lose. Call today. Harry: Louise, Todd was just telling me that his state has community rating. Louise: Everyone pays the same rate, no matter what their age, if they smoke, or whatever. Does it work? Todd: My health insurance went from $1,200 to $3,200 a year. Harry: More than doubled? Todd: Yea, thousands dropped their insurance. We actually have fewer covered now than before. Harry: Congress can do better than that. Louise: If we send them that message. affordable, portable, and emphasis on prevention are honorable and ideals that we all can agree upon. Even his former opponent, Senator McCain, would agree with these goals. Yet there will be substantive disagreement on how we achieve these goals. This public debate will heat up over the coming months and there will be a great deal of horse-trading between the various interest groups in shaping the final legislation. As fellow physicians and informed citizens, we have a duty to our patients and communities to keep our hands on the steering wheel and help guide our nation through this time of turmoil and potential opportunity. How to Perform a Physician Practice Internal Billing Audit An Internal Billing Audit Can Help Ensure Appropriate Payment and Compliance With Applicable Laws Reprinted With Permission From the AMA Private Sector Advocacy Department Auditing physician charges and billing practices is burdensome, but it will typically yield improved claims management processes, cash flow, and compliance with applicable laws and regulations. An annual audit allows physicians and practice staff to identify specific coding issues that may recur in similar claims submissions. Careful pre-submission monitoring and review of these similar claims may safeguard against errors that could result in a claim denial. An internal audit allows the physician and practice staff to identify incorrect billing patterns before claims are denied or outside auditors assess penalties. adherence to health plan medical payment policies. personnel are hired, to identify and address potential errors promptly. In a retrospective audit, a designated person reviews claims for appropriateness after they are paid. The OIG recommends that practice audits be conducted at least annually, and that they be used to identify risk areas such as coding and billing, reasonable and necessary services, and documentation requirements. Physicians and practice staff should participate in the audit process for best results. As a physician, you are entitled to be paid for the services you provide when they are coded and documented appropriately. Physicians and practice staff with a strong knowledge of CPT codes and guidelines, the Resource-Based Relative Value Scale (RBRVS), as well as payer’s medical payment policy, contracts, fee schedules, and reimbursement guidelines, are invaluable to a successful audit. Designate a practice staff person to be responsible for the audit process and consider hiring a consultant specializing in billing and collections to assist in specified audit tasks. The consultant’s contract should ensure confidentiality and compliance with the Health Insurance Portability & Accountability Act of 1996 (HIPAA). to a physician practice’s internal claims review procedures. The American Medical Association (AMA) encourages physician practices to implement a compliance plan, in the document titled “Physician Compliance Planning” (www.ama-assn.org/ ama/pub/category/ print/4598. html). frequency data is different than the Medicare E/M frequency data for your peers by specialty and state or other appropriate geographically defined area. How often should you audit? The OIG recommends that practice audits be conducted at least annually, and that they be used to identify risk areas such as coding and billing, reasonable and necessary services, and documentation requirements. 5. Ensure that the patient’s chart documentation is appropriate to the billed service. The physician may report E/M services based on one of the two sets of CMS E/M coding guidelines. Know which set of CMS E/M coding guidelines — the 1995 or 1997 version — the health plan follows under its medical review guidelines. (Note: The 1995 or 1997 CMS E/M guidelines may be downloaded from the CMS Website, http://cms.hhs.gov/ medlearn/emdoc.asp.) All the required components of the E/M service must be met and appropriately documented in the medical record. 6. Compare the Medicare E/M frequency data for the practice’s state and specialty on which the payer may base its E/M audit with the physician’s E/M frequency data. Explain any significant variance based on patient population or other factors. 7. Identify and maintain a list of claims not accurately processed by the payer. Determine for each claim listed the practice staff’s internal follow-up action to prevent similar non-payments from recurring. New staff should be presented with this information before billing. Additionally, current staff should remain aware and routinely review this information. 8. Hold a meeting with the practice’s claims submission and auditing team, including physicians, to discuss any claims processing issues that can be resolved through staff and physician education or through the adjustment of the practice’s claims submission process. Document the practice’s efforts to improve its claims submission process. 9. Never stop improving the practice’s claims submission and auditing processes. For more information, go to the American Medical Association Private Sector Advocacy Website at www.amaassn.org/go/psa. For additional information, you may also visit the American Academy of Neurology’s Website at www.aan.com. The content for this article was taken from an informational flyer that was developed through a cooperative effort between the American Medical Association and the American Academy of Neurology. © 2008 American Medical Association. HOTEL, TRAVEL & REIMBURSEMENT Travel, hotel arrangements, and expenses for the Legislative Leadership Conference will be the obligation of each individual participant, unless other arrangements are made through your county medical society. The CMA room block is at the Residence Inn at Capitol Park, 1501 L Street, Sacramento, CA. You may make reservations by calling 916/443-0500 or through the website, www.marriott.com/hotels/travel/sacdt-residence-inn-sacramento-at-capitol-park. If you book online, please use the code CMACMAA in the group code box. CMA will provide meals and conference materials to all participants free-of-charge. ADDRESSING CLIMATE CHANGE IN THE HEALTH CARE SETTING A NEW CLIMATE OF ACTION By Cindy Russell, MD Chair, SCCMA Environmental Health Committee The question has finally changed from “Is global warming real?” to “What can we do about global warming?” Our culture is at the same time shifting from a culture of living “for the moment” to a culture that is thinking about the next generation and the problems they have already inherited. In every aspect of our lives, from recycling to the food we buy and the products we purchase, sustainability and “life cycle” are now questioned. Will our garbage continue to be toxic landfill in the future? How can we prevent pharmaceuticals and personal care products from entering the water we drink? Why is there mercury in high fructose corn syrup and plastics in our infant formula? We will be gone, but what about our kids? Asking questions and then beginning to answer them is real progress. Hooray! We are all, as individuals and institutions, part of the solution. Changing habits is essential. which means energy consumption as well. One medical center in the San Francisco Bay Area generates six tons of waste per day. Health care is responsible for oneseventh of the U.S. economy, thus reducing emissions from the health care sector is of national importance. The Environmental Health Committee has decided to focus attention on what we all can do to mitigate global climate change in our own county. Dr. Cindy Russell has served as chairperson of the Environmental Health Committee since 1987 and is also currently serving on the Executive Committee as Vice President, Community Health. A Greening Checklist Health Care Without Harm, an international coalition in the health care sector, has created a wonderful survey to address the state of “Greening” of health care facilities. As one goes through this checklist, it becomes obvious that some things have been done, but there is still a lot of opportunity to take more action. This is a useful tool along with the other resources of Health Care Without Harm and Practice Greenhealth. Hospitals in the county will be asked to take this survey. It is interesting that many of these changes have been instituted already by several large Silicon Valley businesses. Health care institutions are a bit behind the curve, but want to change that, and many are already actively working on these issues. We hope that both large institutions and private practitioners will want to participate. Reduce amount of meat protein on the menus. •	Buy local and seasonal foods. •	Buy organic food when possible. •	Compost food waste. •	Switch to reusable items for patients, staff, and visitors. •	Eliminate bottled water. For more information, you can visit www.noharm.org, and Practice Greenhealth at www.practicegreenhealth. org. SURVEY Of PREGNANT PATIENTS FOUND SIGNIFICANT RISK FACTORS ASSOCIATED WITH TOBACCO, ALCOHOL, AND OTHER DRUG USE Neena B. Duggal, MD, Vice Chair Obstetrics & Gynecology, Santa Clara Valley Medical Center, partnered with the Coalition for Alcohol & Drug Free Pregnancies (CADFP), to conduct a research study to understand the prevalence of Alcohol, Tobacco, and Other Drugs (ATOD) use. The survey was developed based on a standardized screening tool, 5 P’S1, designed to quickly identify patients at-risk for ATOD use. Results of this survey indicate a current ATOD2 abuse rate of 20.1%. About 16% of respondents admitted to smoking tobacco in the past three months, 8.5% reported alcohol or drug use in the past month, and 7% admitted to having difficulties in the past due to alcohol or other drugs. Over 45.4% of women respondents were at-risk 3 for substance use. At-risk was analyzed based on combined responses to adverse mental health, violence, and 5 P’S (Parents, Peers, Partner, Past, Present, and Smoking). of ATOD use, as compared to Blacks and Asian/Pacific Islanders. Significantly fewer Hispanic mothers (9.7%), compared to mothers of other race ethnic groups (27.5%), reported smoking tobacco within the last month. There were no differences between Hispanic mothers (20.4%) versus mothers from other race ethnic groups (19.5%) about having a problem with adverse mental health issues. revise office protocols, and utilize local resources. Limitations of the Study The survey was anonymous. Therefore, follow-up of patients to evaluate pregnancy outcomes was not part of the survey methodology. Footnotes 1. 5 P’S: The Institute for Health & Recovery adapted the nationally known 4 P’s (Ewing, 1990) to develop the 5 P’S screening tool. The screening questions are broad-based and highly sensitive, and one positive answer to any question is considered a positive screen. 2. Current ATOD use: Use of alcohol and other drugs, including prescription medications, within the past month and within the past three months for tobacco. 3. At-Risk: Any positive response for the 5 P’S (parents, partner, past, present, peers), smoking, adverse mental health, and family violence. Acknowledgements We gratefully acknowledge funding support provided by the Santa Clara County Department of Alcohol & Drug Services, and institutional support from the Santa Clara County Public Health Department. Special thanks to Santa Clara Valley Health & Hospital System’s Obstetrics & Gynecology Department for their resources and collaboration in the success of this project. For a more detailed report, or for a copy of the survey instrument, please contact Raj Gill, Perinatal Substance Abuse Coordinator, at 408/494-1555 or at raj.gill@hhs.sccgov.org. “You’ve Been Served” Coping With the Stress of Malpractice Litigation Submitted by NORCAL Mutual Insurance Company As a physician, the odds are greater than 50/50 that you will be sued for malpractice at least once during the course of your career.1 A majority of malpractice lawsuits never go to trial, but the stress of being served can lead to serious emotional, and even physiological, consequences. Researchers have been redefining the way we think about the physician’s experience of being sued for malpractice, exploring professional and economic ramifications in addition to personal and emotional effects. This research is helping physicians manage the short- and long-term impact on their practices and personal lives. Despite these symptoms, the physician is expected to manage the lawsuit, prepare for a trial if necessary, and carry on with his or her practice. Familiarize yourself with your case and be ready and willing to share the burden. It is difficult when dealing with a malpractice suit to allow your legal team to take the lead. Doing so does not mean that you relinquish control of your case. You simply share the burden with professionals who are there to help you. Restore mastery and self-esteem. Use this opportunity to identify areas of your practice that cause you doubt or anxiety, and find ways to change or diminish them. Maximize pleasurable downtime. Some physicians overwork to compensate for a perceived lack of competence. During this difficult period, it is important to balance work with pleasure and engage in enjoyable, stress-relieving activities. Ask for emotional support from family, friends, support groups, and your malpractice insurer. A good defense attorney will tell you not to talk about the case, but that doesn’t mean you can’t talk to trusted confidantes about your experience. Experts agree that is the single most effective coping mechanism. It may also be helpful to seek support from organizations dedicated to assisting physicians in your situation. Support can be found at the nonprofit Physician Litigation Stress Resource Center at www.physicianlitigationstress.org. Additionally, physicians should look to their medical malpractice insurer for support. Emergency Physicians. Available at www.acep.org/webportal/ membercenter/ aboutacep/careers/ residentsres/profskills/GettingSued. htm. Accessed December 12, 2005. The coping suggestions presented may significantly mitigate the emotional impact of a lawsuit and help physicians to maintain an optimistic outlook. Endnotes 1. Brazeau MD, Chantal M.L.R. “Coping with the Stress of Being Sued.” Family Practice Management, May 2001. 2. Kelly MD, Frank B., and Mark C. Gebhardt MD. “The Liability Stress Syndrome.” American Academy of Orthopaedic Surgeons Online Bulletin, December 2004. Printed by permission of NORCAL Mutual Insurance Company. NORCAL is the premier provider of professional liability insurance for physicians, medical groups, community clinics, hospitals, and medical facilities. To access additional articles published by NORCAL, visit www.norcalmutual.com. You deserve more than a little gratitude for a career spent practicing good medicine. That’s why The Doctors Company created the Tribute Plan. This one-of-a-kind benefit provides our long-term members with a significant financial reward when they leave medicine. How significant? Think “new car.” Or maybe “vacation home.” Now that’s a fitting tribute. To learn more about our medical professional liability program, including the Tribute plan, call The Doctors Insurance Agency at (415) 506-3030 or (800) 553-9293. You can also visit us at www.doctorsagency.com. With over 25 years of real world design experience, 1027 Design delivers designs that work. It doesn't matter how "neat, cool or beautiful" a design is if it doesn't work for you and your customers. If you’re looking for a unique solution for your business, contact us now. Awards Banquet and Installation Tuesday, June 2, 2009 6:30 pm Social 7:00 pm Dinner & Program The Fairmont Hotel, San Jose Installation Howard Sutkin, MD, President 2009-10 Award Honorees Bernadette Loftus, MD; Thomas M. Krummel, MD; George P. Kent, MD; Martin L. Fishman, MD; Seham F. El-Diwany, MD; and Peggy Fleming Jenkins Please mark June 2 on your calendar now. Formal invitations will be mailed in April. All members are asked to please consider hosting a medical student or resident. Not a Member of Santa Clara County Medical Association or CMA? Contract Analysis Legal Hotline Legislative Hotline HIPAA Compliance Seminars and Conferences Extensive Online Resources including over 200 letters, agreements, forms, etc. • Plus - Free Legal Advice with CMA ON-CALL Documents! Federal, State, and Local Advocacy: Your dues are an investment which supports our eﬀorts in protecting your rights. If We Don’t Fight for You… Who Will? Would you like to receive updated coding & reimbursement news by email? If so, please call the SCCMA office to provide your email address at: 408/998-8850 ext. 3007 or email: sandie@sccma. org. You may also visit our website at: www.sccma.org. For coding questions and reimbursement issues, contact Sandie @ 408/9988850 ext. 3007 or email sandie@ sccma.org. by another physician), anatomic modifiers (e.g., RT, LT, F1, F2), -91 (repeat clinical diagnostic laboratory test), and -59 (distinct procedural service) will accomplish this purpose. Modifier -59 should be utilized only if no other modifier describes the service.” In this case, you would report 95004 on one line with the number of units as 80 and on a second line, report 95004 with the appropriate modifier and remaining units of 13. Q: How do I bill for a failed IUD insertion? The physician tried for 30 minutes, but was unable to insert the IUD. You may bill the IUD insertion, 58300 with the modifier -53 appended. You may also consider contacting your representative that supplies the IUD and ask if they will replace it, since it cannot be used again. If the patient returns at a later date for the insertion, and it is successful, you may bill again for the insertion and the IUD as well. medical offices, strategies for managing overweight patients, billing and procedure codes and clinical guideline abstracts. In addition, these toolkits equip health care providers with strategies to assess and treat overweight and at-risk for overweight patients, and offer pertinent information for providers to consider when discussing healthy lifestyles and weight management with patients. For more information about the Obesity Prevention Provider Toolkits, visit: http://www.calmedfoundation.org/projects/ obesityProject.aspx or contact Alisa Matthews, Obesity Prevention Project Director at 916.779.6632. 2009 Physician Membership Directory is now available! Robert M. Cheney was named by Medical Economics to their exclusive 2008–2009 List of 150 Best Financial Advisers to Doctors. This honor is based on criteria such as experience, credentials, education, and assets under management. Call Rob to: • Contribute up to $200,000 (or more) annually, per doctor, to ERISA-qualiﬁed Retirement Plans and potentially reduce your annual income taxes by up to $100,000. • Utilize institutional downside risk management techniques for your investment portfolios. • Potentially protect your income and savings from creditors, frivolous lawsuits, and signiﬁcant life challenges. • Consider funding all insurance premium costs before taxes to further reduce your income taxes. • Discuss utilizing alternative investments like a university endowment. Investment Management and Financial Planning provided by Greenbook Investment Management. Robert Cheney, registered representative, offers securities through First Allied Securities, Inc., a Registered Broker/Dealer. Member FINRA/SIPC. ©2009 Greenbook Financial Services. All rights reserved. Morning Session: 8:30 a.m.–11:45 a.m. Learn how to get paid the reimbursements your practice deserves. Workshop leader—Susan Charkin, President, Healthcents—leading experts in negotiating with plans. Afternoon Session: 1:00 p.m.–4:00 p.m.
How to Improve Your Practice ! w Ne Financial Performance Learn the proven steps to take to increase your revenues and practice profitability. Workshop leader—George Conomikes, CEO, Conomikes Associates, Inc.— nationally-recognized practice consultants. 1:00 p.m.–4:00 p.m. Santa Clara County Medical Association, 700 Empey Way, San Jose NOTE: To register more than one person, copy and complete information on separate sheet. Registration Fee: $143 per person, per seminar. Special discount: you will receive a discount for enrolling in both seminars at a per person price of $261, a saving of $25. Please make check payable and send to: Conomikes Associates, Inc. Please check here if you are disabled and require special services. Attach a written description of needs. Guarantee: It’s this simple: If you attend, and for any reason decide the workshop doesn’t live up to your expectations, we will refund all of your money or arrange for you to attend another workshop free. Whichever you choose. demonstrates “meaningful use” of an EHR system. Physicians with significant Medi-Cal patient loads (20% or more for pediatricians, 30% or more for other specialties) may be eligible for additional bonuses paid through state Medicaid programs. As eligibility is based on usage, even physicians who already use EHR systems will be eligible. While the bill does include Medicare payment reductions (starting at 1%) for physicians who do not implement HIT systems, these do not take effect until 2015 and there are exceptions for significant hardship cases. This is the first substantial federal funding provided to help physicians implement HIT systems—systems that will generate benefits across the health care spectrum. CMA is currently analyzing the HIT provisions of the bill, and we will provide physicians with details and guidance on how to take advantage of the incentives soon. tax on cigarettes and other tobacco products. The final version of the bill does not include the controversial ban on physician-owned hospitals. The bill also waives the 5 year waiting period for legal immigrant children and pregnant women. California currently covers them with state-only money. President Obama also rescinded a Bush administration policy that has impeded state efforts to provide health insurance to children from low- and middle-income families. Under the Bush policy, states were not allowed to cover children from families with annual incomes above 250% of the poverty level — $53,000 for a family of four — unless 95% of eligible children in families making less than 200% of the poverty level were already enrolled in Medicaid or SCHIP. This nearly impossible standard has blocked or delayed the expansion of coverage in several states. NOW IS THE WINTER OF OUR DISCONTENT By Lawrence Daniel Stern, MD “Now is the winter of our discontent Made glorious summer” (“Richard The Third,” William Shakespeare) We have ached for this and finally got it—a change of administration and a leader with potential. Now what?! We now have the results of our behavior for the past century; military intrusion by the U.S. in the affairs of a multitude of nations, a debt that will impoverish our grandchildren, and the despair of nations, who at one time revered this haven of liberty founded on justice. Words issued to justify our actions, such as “democracy” and “lack of colonial intent,” have been used previously by the British when they occupied Mesopotamia in 1917. Nothing is new under the sun. Perhaps a reappraisal of who we are as humans might be in order. Why, for example, when Moses came down from Sinai, did he enunciate things that any mother would demand of delinquent children? Because his itinerant group of refugees from Goshen were getting restless and doing naughty things, even going so far as to worship the Golden Calf, as they attempted to understand how they had come to this dreadful place in a burning desert far from the lush fields of the Nile Delta, now dreamily remembered as a wonderful place despite the harsh overseers, etc. While the Golden Calf might have offered solace to some, Moses had other ideas, some of which eventually found their way into the Constitution of the United States. very well-educated and thoughtful men who used the Greek model to create the ideal state in North America. What they did was borrow from Plato’s state ruled by “philosopher kings,” and codified it in such a way that it permitted evolution, but hampered participation by the governed. We have almost sanctified our constitution to the point that any real reform is being stifled by those who feel that our founders did enough, and though minor improvements might be permitted, real participatory democracy has never been given a chance to succeed. Because we have been fortunate to have a huge number of well fed, literate citizens, like it or not, we have an obligation to this society that should be obvious to us all. We cannot continue to look apathetically at Sacramento or Washington, D.C. and shrug as we go about our daily tasks and mutter, “a plague on all their houses,” leaving “them” to manage our world problems. I believe that our population yearns, silently for the most part, to suffer if need be, but to contribute in a meaningful way to help us out of our troubles. We have grown used to this form of government, but recent events have clearly demonstrated that unless the majority of the “masses” are represented in the halls of power, we can expect more of the same, ad infinitum. The internet was one method recently employed to bring the people into the decision-making process. Our founders, probably realistically, did not trust the mostly illiterate masses to know the right path to workable government. However, with current increased literacy and universal education, it should be reasonable to expect that meaningful changes in government are worth considering. For example, though recent surveys may bely this, we have in this country a standard of living distributed fairly widely that cannot be matched in most countries. We have, to be sure, recent changes in energy and food cost, and an unsatisfactory war that has no predictable end, and a debt that will create hardship for generations. There is reason enough to believe that we can overcome this temporary set of issues, but we need more input from those who will have to pay for it. Now is the Winter of Our Discontent, continued from previous page panic when our seniors no longer can earn a good livelihood; will they get ill or disabled, and then who will care for them? These are huge problems that occupy ever larger segments of the population. Our Congress talks a lot, but no real solutions lie immediately at hand. We have had enough of war this past 100 years, with dead Americans lying on foreign soil in 50 countries around the world, and mutilated wounded eating up billions of dollars in obligatory care that will persist for generations. No matter that some feel that some of these wars have been necessary and some not. There will be times when taking up arms will be necessary to defend ourselves or our friends, or those too powerless to defend themselves. This burden is the price of citizenship, and our position of leadership in the world. It should be divided amongst ALL of us. When a representative citizen army is created, ALL of us feel the need to justify the potential death or mutilation of members of our families. We really take an interest, and begin to ask probing questions of those who will take our sons and daughters and possibly kill them. At present, we are living as if the ghastly carnage in the Middle East does NOT EXIST. We talk a lot, but most of us are not bleeding. When our own sons and daughters lie wounded and dying, THEN we will take notice. during debate. Translating this to larger regional matters, one can make a case for developing a working agenda for the country as a whole, with the Congress tasked by the people to IMPLEMENT the decisions of the people, rather than initiation of programs. Reelection of the members of the Congress then begins to have meaning: members will be reelected based on performance, on success or failure to implement the WILL of the citizenry. There will always be differences of opinion as to what is or is not important; these are matters that should be debated, intensively, at the local community level. Voices pro and con should be heard and arguments raised as to the need, feasibility, etc. of the issues. After reasonable debate, a vote settles the matter for that period of time. The results of the debate and vote can be sent to the Legislative Assembly, where the subject will be reexamined, synthesizing votes from town councils in an entire region. The ideal society is, thus, NOT an easy place in which to live. Benefits of living in a society, where rights are clearly a part of the unwritten contract with each citizen, are not without cost. Though many citizens customarily volunteer their energy and wisdom to activities that benefit the society in a variety of ways, unless ALL are involved, there cannot be an atmosphere of active virtuous obligation associated with the delights of citizenship. Only in such a society can one then demand actions by the leaders based on integrity, rather than naked greed. To expect leadership to adhere to strict standards of behavior, ALL citizens must demand the same of themselves. Understandably, this will not happen quickly, but until it does, we will deserve what we get from our government. CLASSIFIED ADS office space for rent/lease MEDICAL OFFICE SPACE FOR LEASE • East San Jose 1,380 sq. ft. excellent medical suite across from Regional Medical Center. Available October 2008. First floor, with lab and xray suites in the building, to make it convenient for your patients. Lots of parking available. Great visibility at corner of N. Jackson and Montpelier Dr., located at 244 N. Jackson Ave. Call Tania at 408/923-0257. MEDICAL/DENTAL OFFICES FOR LEASE • WEST SAN JOSE/ CAMPBELL/LOS GATOS/WILLOW GLEN Exceptional location for quality suites consisting of first floor: (1) 1,595 sq. ft. Second floor: (2) 1,030 sq. ft.; (3) 1,675 sq. ft. (combined 2,705 sq. ft.); (4) 1,500 sq. ft. (combined 4,945 sq. ft.). Tenant improvement allowances. Bldg. elevator. Paradise landscape. Minutes from hospitals. Excellent visibility and signage with ample parking. Easy access to Hwys. 17/880 & 85. Located at 2242 Camden Ave. (Bascom Ave.), San Jose. Call Sheldon at 408/377-7383. MEDICAL OFFICE FOR LEASE/ SUBLEASE/SALE Office in close proximity to O’Connor Hospital for lease/sublease/sale. Please call 408/923-8098 for more information. Options include two exam rooms plus office. Newly remodeled office space perfect for cosmetic dermatologist, facial plastic, or plastic surgeon. Near El Camino Hospital. Call 650/804-9270. OFFICE SPACE FOR LEASE • SAN JOSE 600–1,900 sq. ft. in West Valley Medical Building, second floor, elevator, separate entrance. Call Helen at 408/243-6911. OFFICE SPACE FOR RENT • MTN VIEW Consult room and exam room available in shared office suite, near El Camino Hospital. Shared receptionist and billing services available if desired. Contact Len Doberne, MD at 650/967-8841. OFFICE SPACE FOR SUBLEASE • MTN VIEW Two exam rooms and one doctor’s office, five days a week, shared waiting room, in Mountain View, on South Drive. Call 650/967-7471. Two nice and large exam rooms (dedicated), shared waiting room. Available five days a week, 2585 Samaritan Drive, San Jose. Please call 408/356-7788 for more information. MEDICAL OFFICE SUITE FOR RENT • SAN JOSE Medical office suite for rent at 93 N. 14th St. San Jose 95112. Contact Dr. Sajjadi at 408/294-1825 or 408/867-1111. ATHERTON SQUARE MEDICAL/ DENTAL BUILDING A newly upgraded Class A building offers a variety of spaces from 1,166 sq. ft. and up for medical/dental use at 3301-3351 El Camino Real, Atherton. Tenant improvement allowances available to design suite to meet your needs. Excellent onsite parking, close to Stanford and Sequoia. Trask Leonard, Bayside Realty Partners, 650/282-4620 or Alice Teng, Colliers, 408/282-3808. PRIME MEDICAL SPACE • PRIME SAN JOSE LOCATION 2,048 sq. ft. ready to occupy medical office, previously occupied by RAMBLC Pediatric Group. Located at 6140 Camino Verde Dr, San Jose, in the Santa Teresa Medical/Professional Center across from Kaiser Hospital. Call Virginia at 408/5280571. OFFICE SUITE AVAILABLE Location is highway 85 at De Anza. One suite available. Currently configured with 6 tx rooms/offices, entry, large master office with balcony. Street signage to 100,000 cars a day. Marble entry. Zoned medical/ office. No variance required. Looking for established business/practice that values prime location in beautiful building. Please be qualified. No start ups. Contact Dr. Newman at 408/996-8717. Brokers welcome if you have a client. Compare with space by Good Sam at $3.50 sq. ft.
MEDICAL OFFICE FOR LEASE • LOS ALTOS Medical office for lease, 1,050 sq. ft., three exam rooms and a doctor’s office. Large waiting and reception room. Located on Altos Oaks Drive near El Camino Hospital. Call 650/575-6889. MEDICAL OFFICE FOR SUBLEASE • LOS GATOS Close proximity to Good Samaritan Hospital. Reception, two exam rooms, doctor’s office, and kitchen to share with existing Internist. Please call 408/3562900. FOR SALE • MEDICAL OFFICE CONDO • EAST SAN JOSE 135 N. Jackson Ave #101, 1,641 sq. ft., possibility for two doctors’ practice. Adjacent to Regional Medical Center. Four exam rooms, waiting area, doctor’s office, kitchen, storage rooms, great price $499,999. Contact Pearl Bell, Broker Associate APR at 408/204-7077 or pbell@apr. com. MEDICAL SPACE AVAILABLE State of the art medical space available to sublet on Bascom and White Oaks. Up to three exam rooms with shared common areas. Ideal for primary care or specialist. For more information, please contact Beth at 408/369-4210. PRIVATE PRACTICE for sale PRIVATE PRACTICE FOR SALE IM/FP/GP. Primary care practice for sale, including inventory and equipment. Close to O’Connor Hospital. If interested, please call Stacy at 408/297-2910. PRIVATE PRACTICE FOR SALE Established/Active Internal Medicine/ Primary care practice for sale. Work/ live in Coastal California. Enjoy best of everything. If interested, please call 831/345-9696. Classified Ads, continued from page 37 IMQ SEEKING PRIMARY CARE PHYSICIANS The Institute for Medical Quality (IMQ) is seeking primary care physicians, board certified in either Family Practice or Internal Medicine, to serve on Judicial Review Committees (JRC) for the California Department of Corrections and Rehabilitation (CDCR). These review committees hear evidence regarding the quality of care provided by a CDCR physician. Interested physicians must be available to serve for five consecutive days, once or twice per year. For more information, please visit our website http:// www.imq.org/imqdoc.cfm/9 (Peer Review Consultation Program) or contact Leslie Anne Iacopi at 415/882-5167 or email liacopi@imq.org. condo/COTTAGE rentals BEACH HOME • RIO DEL MAR/APTOS Two story, three bedroom, remodeled home, 1½ blocks from beach, available for weekend or weekly rental. Email bystrong@yahoo.com for details. COTTAGE FOR RENT • SARATOGA Cottage in Saratoga. Retreat-like setting. Close to great hiking and biking trails. Close to Hwy 85. One large bedroom, living room, kitchen, and bath. Private driveway and fenced yard. Rent $1,290 per month. Available mid-August. Contact Carolyn Silberman 408/867-1815, or cell 408/2217821, or email wwswolfe@aol.com. FOR SALE BEAUTIFUL HAWAIIAN CONDO Poipu Beach, Kauai. Lovely 2 BR/2 BA condo, across street from ocean. Recently remodeled bathroom and kitchen with granite countertops, new carpeting throughout. Three lanais with ocean and mountain views, and the tropical gardens which make the Nihi Kai complex so special. $885,000. Call 650/949-3353. OAK MEMORIAL PARK CEMETERY PLOTS Oak Hill Memorial Park--single plots for sale by owner in sold-out hillside section. Selling two for $10,000 or all four for $18,000 (transfer fees included). No brokers involved. Contact Joyce at 408/3772459. San Jose Rotacare Adult Free Clinic needs physician volunteers. Time: Wednesday nights from 6-9 p.m. Where: Washington Elementary School (in the clinic building on Edwards between Almaden and First, a residential neighborhood about a mile from the Fairmont). Patient mix: uninsured, many workers, many diabetics, many Hispanics. Small free medicine dispensary. Need: Internal Medicine, Family Practice, General Medicine. Malpractice insurance and evening snack provided. Can you help out once a month? Email: nedde@earthlink.net. Phone: 408/354-7613. PEDIATRIC PRACTICE Will buy Pediatric practice in South Bay. Call 408/4552959. We also go beyond medical care and provide our patients and families with disease counseling, spiritual support and reduced rates for patient and family housing. For more information: 888-637-2762 The Adult Heart Transplant and End Stage Heart Disease Program is associated with California Pacific’s Heart and Vascular Center, which offers quality, comprehensive, patient-centered cardiovascular care by a team of pioneering physicians integrating leading-edge technology. J. donald Hill, m.d. g. James avery, m.d. Preben Brandenhoff, m.d. ernest Haeusslein, m.d. What’sEarned the Big Straight Deal withA’s NORCAL’s We’ve for 25 CME? Years Last year participation in NORCAL’s Continuing Medical Education program reached a record 21,734 – nearly double NORCAL has achieved an “A” financial rating from A.M. Best, the leading provider of insurance industry ratings, for the past the number of our policyholders! Why? Because NORCAL physicians use our unparalleled CME activities time and again. quarter century. Our financial stability has allowed us to return $358 million in dividends to NORCAL policyholder owners. Visit www.norcalmutual.com today, or call 800.652.1051. NORCAL. Your commitment deserves nothing less. Visit www.norcalmutual.com today, or call 800.652.1051. NORCAL. Your commitment deserves nothing less. 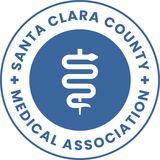 NORCAL is proud to be endorsed by the Santa Clara County Medical Association NORCAL isasproud to be endorsed by the Santainsurer Clarafor County Medical Association the preferred professional liability its members. as the preferred professional liability insurer for its members. You practice with passion. Our passion protects your practice.